You probably know we discovered a mysterious leak in our ceiling around the beginning of December when we were in Suffolk, Virginia. When the clouds opened up, rain came in through the air-conditioning vent that was located inside the ‘media cabinet’ over the co-pilot’s chair. This is the cupboard that holds the satellite dish box, and where our surround-sound stereo with more than 230 CD’s are stored. We are realistic enough to know an RV automatically comes with frequent repair issues. However, this leak was driving Mike CRAZY. Rain is not as soothing and relaxing when it happens INSIDE your house. I was beginning to loath the weather segment on the local nightly news. When rain was forecast, Mike became somber and irritated. He lost countless hours of sleep worrying over the fact that we didn’t know where the water was coming from and we didn’t know how much damage the unwelcome water was doing in the hidden sections of our ceiling. Mold and rot. These were the things we focused on when the skies were cloudy. Something had to be done. We had visited a couple of repair places in between stops as we moved through Virginia and North Carolina, but no one we had talked to was equipped to help us with the problem. Then Mike had an idea! We bought this coach through a broker who is a native of the Carolinas. Maybe Mr. Joel Elmore had an idea on who could help us with this issue. Mike sent him a text and we had a name in 5 minutes. Our friend Joel gave us the name and contact number of his buddy Kevin Dunn of Complete RV in Denver, N.C., just outside of Charlotte. We were about 2.5 hours from there. Time for a detour. 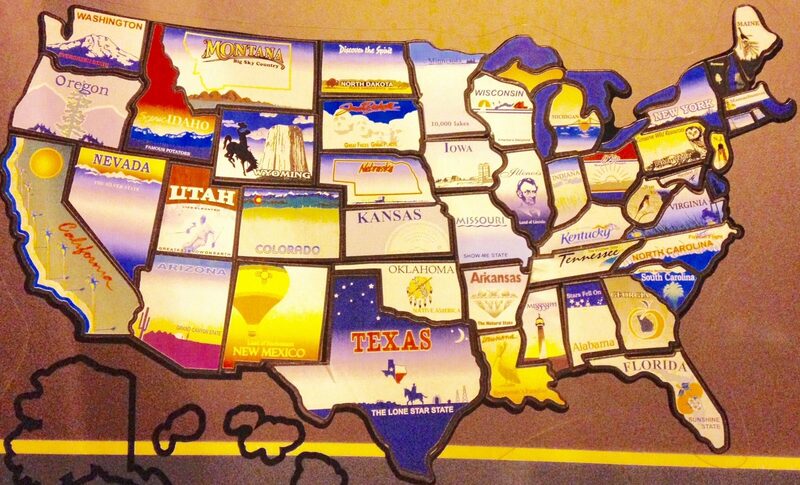 We had already scratched the Tar Heel State off the Lower 48 in 48 Tour, but we immediately decided we were going back. Mike placed a call to Complete RV and scheduled a slot for us on their calendar. We wanted to arrive at the Dunn’s shop when they opened first thing on a Monday morning. To achieve this, we pulled out of Magnolia RV Park & Campground just after 2 on a Sunday. Our destination was the Flying J Truck Stop outside of Charlotte. I am getting used to sleeping with the truckers! We planned to sleep near our destination on the previous night and have a stress-less morning on the last leg of our trip to the shop. We are getting good at this, because everything played out as intended! We pulled into the parking lot before the other truckers stopped for the night. Found a good spot at the end of a row where we could push out the slides on the passenger side. We watched the evening news, ate dinner, walked the dogs and got pretty good sleep. In the morning we had some breakfast at the Denny’s inside the gas station, and were back on the road by 8:30. We even beat the owner to his own shop that morning! The folks at Complete RV were great. Mike’s basic requests were to find and fix the leak (please, God); install a new Traveler Satellite on top of the bus (the leak had ruined the cables in the previous one, so it was time to upgrade to an HD version); and fix the heat in our bedroom. They assured us that everything could be done within one week, if we moved out and left it with them. The only snag was that the satellite would be shipped to the repair shop from Atlanta, and the 2014 Winter Vortex was predicted to cover up Charlotte in snow and ice during midweek. If the weather impacted the UPS delivery schedule, our repairs could stretch over the weekend and into a second week, which translated to more hotel nights and a bigger bill at the end. After talking over logistics with Mr. Dunn, we decided we would bow to Mother Nature and park the bus at a campground nearby to wait for the storm to run its course. Mike gave him a deposit when he placed the order for the satellite and told him to check back with us when it arrived. After the weather cleared, and all necessary parts were in-hand, we would check into a hotel and drop off the Monaco at Complete RV. A place called Cross Country Campground was located down the street from the shop in the same town of Denver, North Carolina. It was a gigantic park of seasonal campers in the area for one of two reasons: Lake Norman or NASCAR. A “weekly” section for transients like us was located up at the front of the park in a parking lot behind a recreation hall. We checked ourselves in about mid afternoon. Mike got us all set up while I ran to the store for winter storm groceries and stopped at the liquor store for winter storm entertainment. The only thing we didn’t have was heat in the bedroom, but we were used to that by now. 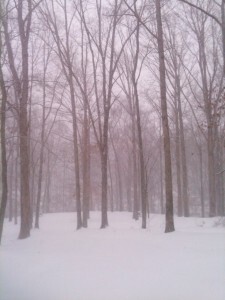 Just as predicted, it started snowing late Tuesday and didn’t stop until Thursday. 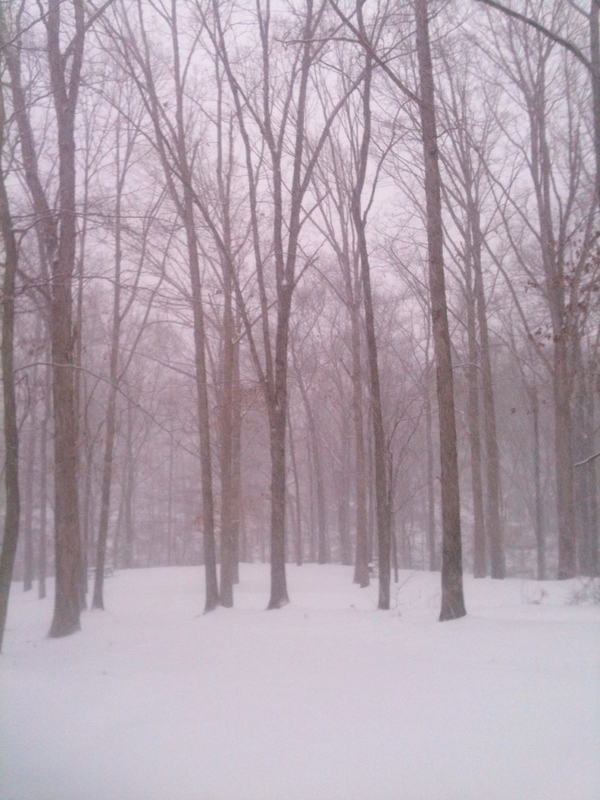 Everything was white, and pristine. The air was quiet and peaceful. 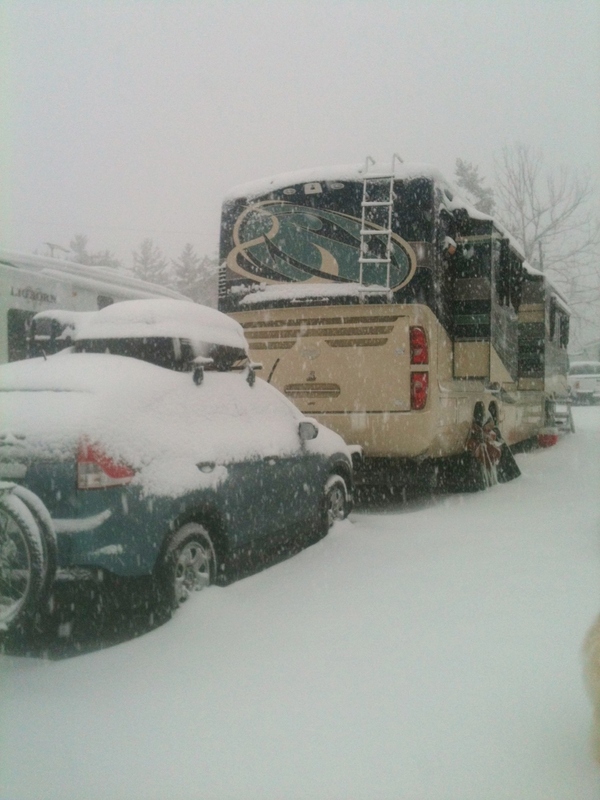 The campground where we were staying wasn’t the most elegant of all RV parks, but when it was covered up in a foot of white fluffy snow, it looked like a winter wonderland. I cooked comfort food and played on the computer. Mike read. We sat and stared out the window a lot in between naps. The dogs were in awe of the frozen stuff. Cessna loves ice, and this was like her entire world had turned into one giant snow cone. When we went on walks, she would put her head down and drag her tongue along the ground until she had scooped up a mouthful of snow. She would eat that all up and go down again. Piper didn’t know what to do, so he just copied the big dog. 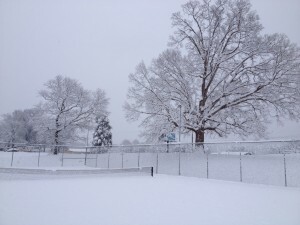 The tennis court at the campground was the perfect playground for the dogs to run and tumble to their heart’s delight. Mike built a UT snowman complete with gloves, rain gear, and Mardi gras beads. All in all, the four of us had a great time with the snow event. I even learned that Mike can make a mean hot buttered rum before it was all said and done. One of the things I did while we were hunkered down was finding us a place to stay when we finally did drop off the bus for repairs. We got lucky and found a little lake cottage to rent on Lake Norman. It was owned by a plastic surgeon and his wife who had it listed on www.vrbo.com. The location was good, the price was right, and they allowed pets. For much less than the cost of a hotel room, we were lucky enough to find a 3 bedroom, 2 bath, waterfront house with a fully stocked kitchen, a washer & dryer, cable television, a fishing dock, and a large fire pit out in the yard. One Monday later, we did a repeat performance at Complete RV, but this time we drove away in our car while they parked the Monaco inside their giant shop. Back at our little cottage we killed time doing lots of nothing. Mike fished from our dock. I sat in the sun and read old magazines the owners left on the coffee table. We were able to save money by taking advantage of the equipped kitchen. We cooked our dinners at the house and avoided expensive restaurant meals while we were displaced. In the evenings we would have a big fire in our pit down by the water. The cottage was actually located in a Trump National Golf Club development. I think the little lake cottages were there first, and then the developers came in and bought what was left of the entire peninsula. We took different routes on our daily walks, and there was always something interesting to look at. Some streets were lined with houses like the one we were staying in. Others were lined with mini-mansions oriented toward the water. Some streets had a mixture of both. By the time Friday came, Mr. Dunn called to say the Monaco was ready. They found the leak was coming in through our awning on the side of the bus! They corrected the problem and determined that we did not have any rotting up in the ceiling. Whew. The new satellite was installed and now we had DirecTV in HD. Lastly, we had heat in our bedroom for the first time ever. Two other shops in Florida and Texas had looked at our heating problem, and weren’t able to fix it. We love Complete RV in Denver, N.C. Mike was so happy; I could literally see the stress wash away from his face. When we settled the invoice, and moved our suitcases back inside, it was late in the afternoon on a Friday. Not the best time to set out on a road trip. There was a Wal-Mart located a couple of miles down the street, so we decided we would stay in their parking lot overnight. We would get good rest and avoid the stress of the end-of-week rush hour on the highways around Charlotte. In the morning we would drive south to Charleston. When we arrived to our little lake cottage, the snow and ice were so thick we had to park at the top of the driveway and slide down to the door. 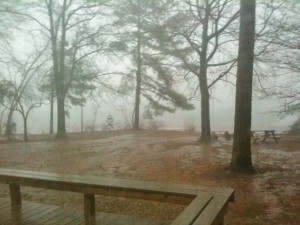 When we left, we sloshed through rain and mud while loading the car. 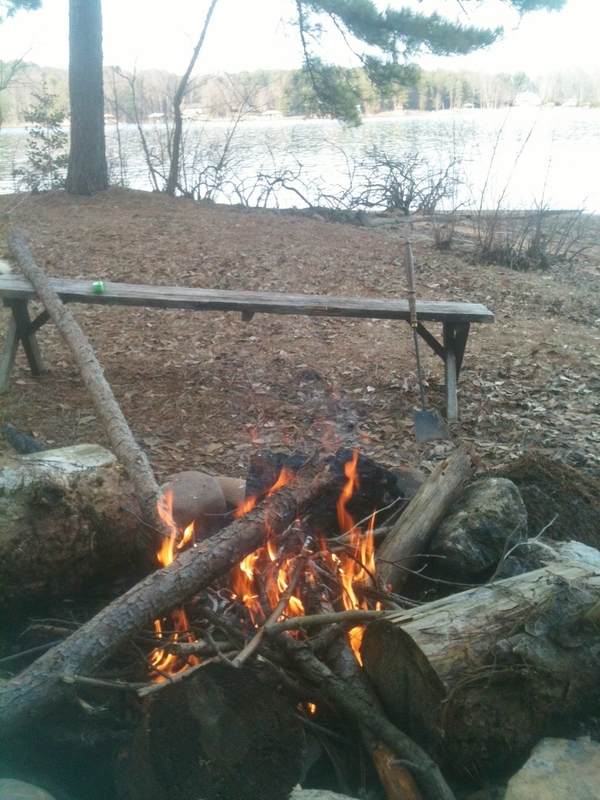 Luckily, the cottage came with a fire pit! 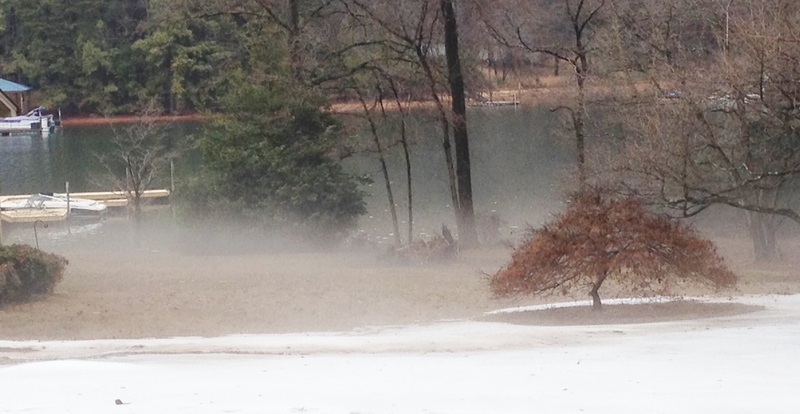 As the snow melted at the lake, there was an spooky fog hanging delicately over the landscape. Mike got to fish every day from our own personal dock at our cottage on Lake Norman. 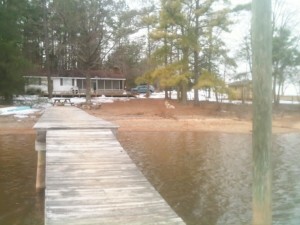 The view of our back yard and dock from the deck at the cottage we rented on Lake Norman. 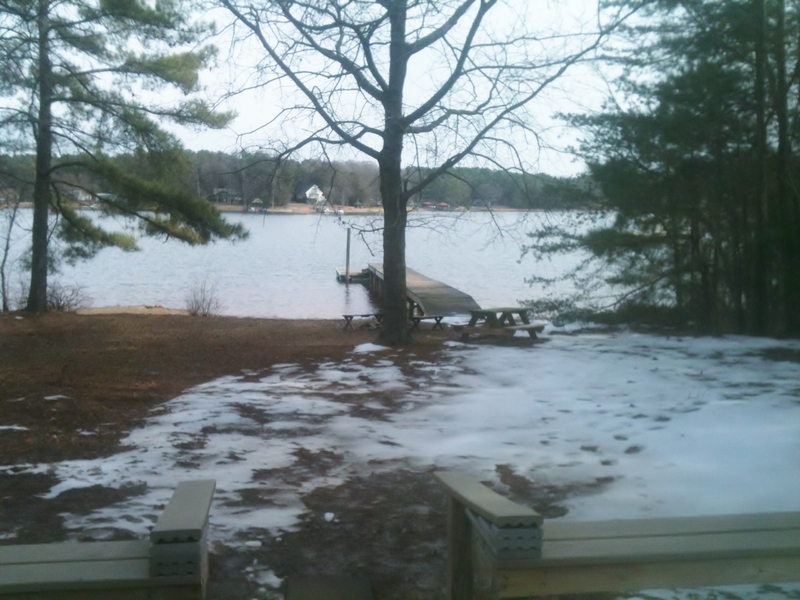 It took a long time for all of the snow to melt because the property is shaded most of the day. From the end of the dock looking back toward the little cottage we camped in while we waited for repairs to the Monaco to be finished. 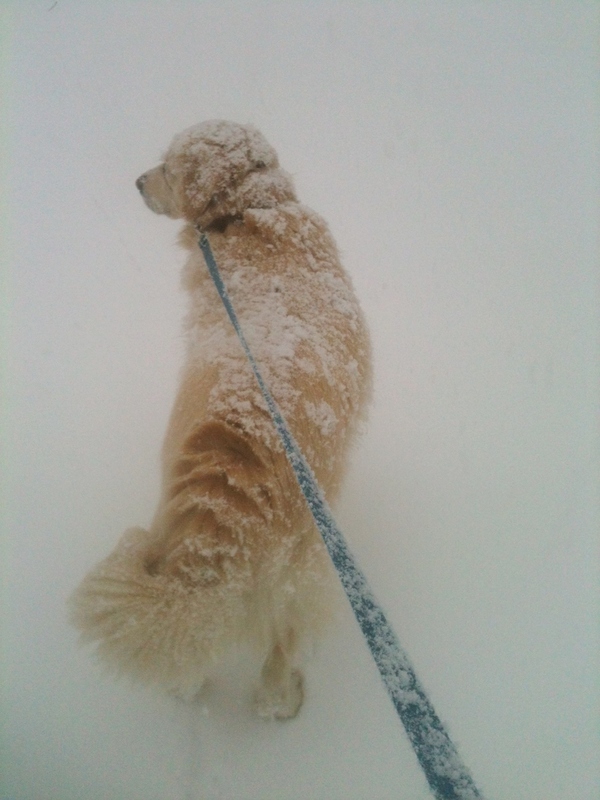 Cessna and I took our morning walk while the snow was still coming down. We were both covered in white powder by the time we made it back to the bus. Our spot at the Cross Country Campground in Denver, N.C. wasn’t the most attractive place to camp, but after it was covered in about a foot of snow the scene became very charming. 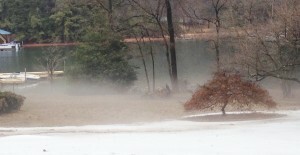 Thanks goodness we knew this storm was coming! We had plenty of time to get parked somewhere and stock up on adequate amounts of food and booze! 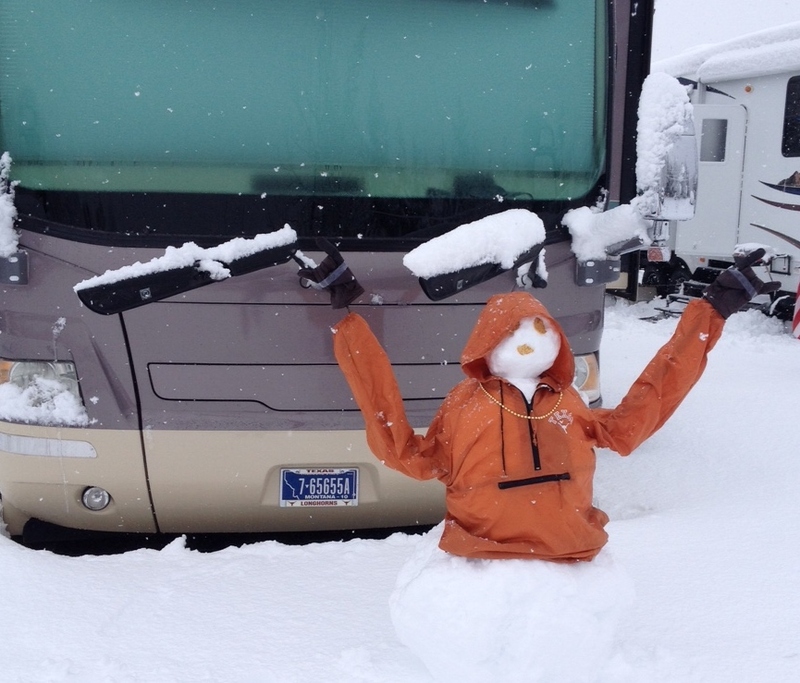 If Mike it going to play in the snow, you better believe there will be a Hookem’ Horns snowman to show for it! (Please notice the position of the fingers on the gloves). The Mardi Gras beads were a contribution from our neighbors across the way. The “dog park” at this stop was an enclosed tennis court. Piper and Cessna had MUCH more fun romping in the snow than they would have had on the normal bare concrete. This entry was posted in North Carolina on March 23, 2014 by Dina Martin. 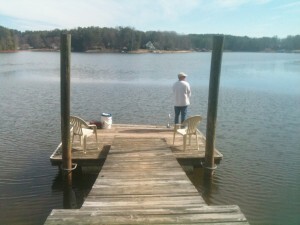 Loved your write up about your stay at Lake Norman and the repair work Kevin did. You are a very interesting writer and I’m looking forward to reading about all your travel adventures. We live at the Lake, about 2 miles from Complete Rv. However, we missed that nice snow you enjoyed, We spend Jan-Mar in the Keys. 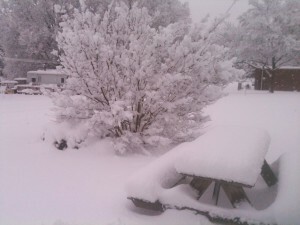 Sitting here at Marathon right now with temps in the 80’s, it’s nice to reminisce about that white stuff. Thanks for the feedback! It was 18 degrees this morning, so enjoy your time in sunny Florida! We appreciate you checking in with us!